Oops - we don't appear to have a video for the fi-4220C2. The Fujitsu Fi-4220C2 document management scanner offers high quality output resolution up to 600dpi. Control over error diffusion, colour dropout and gamma correction via the driver allows a wide variety of documents to be scanned. The user selectable black background enables the use of document deskew and autocropping of mixed document and high quality scanning of thin documents. With a slide away output tray the 4220 can be positioned near the users workstation for ease of use. When not in use the scanner reverts to a standby mode using only 6 watts of power. A "Scan" button on the scanner allows the scanning process to be started from the scanner. A "Send" button allows the document to be scanned and sent to either your default printer or selected application on your PC. 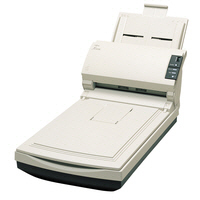 The scanner has both an industry standard SCSI and USB 2.0 interface as standard.